Star-Sung Bard is an epic Neutral creature card. It is part of the Clockwork City story set. A playset of the card is awarded for completing The Red Mountain. The premium version can only be obtained by soul-summoning, which is only possible after the completion of The Red Mountain. "Our hero, our hero, claims a warrior's heart." This creature's on-summon quote comes from the song "The Dragonborn Comes", sung by bards in Skyrim. 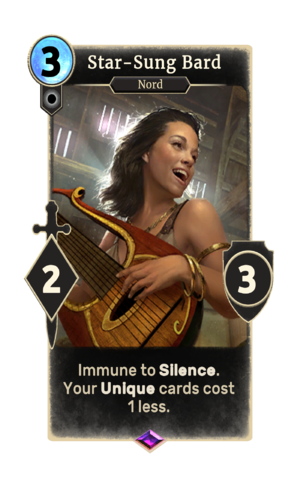 This card depicts Lynly Star-Sung, from Skyrim. She is depicted with black hair as described by Sibbi Black-Briar, and not as she physically appears in Skyrim with blonde hair.